Have you tried it before? All you need to do is whizz up cashews with water and hey presto, you've got cream! It's very versatile and can be used in both savoury and sweet dishes. Any recipe calling for cream (and usually yogurt or cheese too) can be switched up for cashews instead. Mushrooms are one of the things we love in this house. They add that wonderful umami flavour, as well as being packed with B vitamins. Another favourite ingredient is the humble lentil. Red, green, French, black: we have a large collection of the different types in our pantry as an everyday staple. Seriously, we cannot get enough of them! Lentils go in curries, soups, baked dishes, salads and any other use we can find for them. We don't always put them in veggie balls though (we mainly use chickpeas or tofu), but after eating a delicious lentil burger in country Victoria recently, we were inspired to make our own version. We served this meal with beetroot & cabbage sauerkraut, steamed potatoes and fresh greens. It would also be delicious on top of wholewheat pasta, brown rice or baked potatoes. 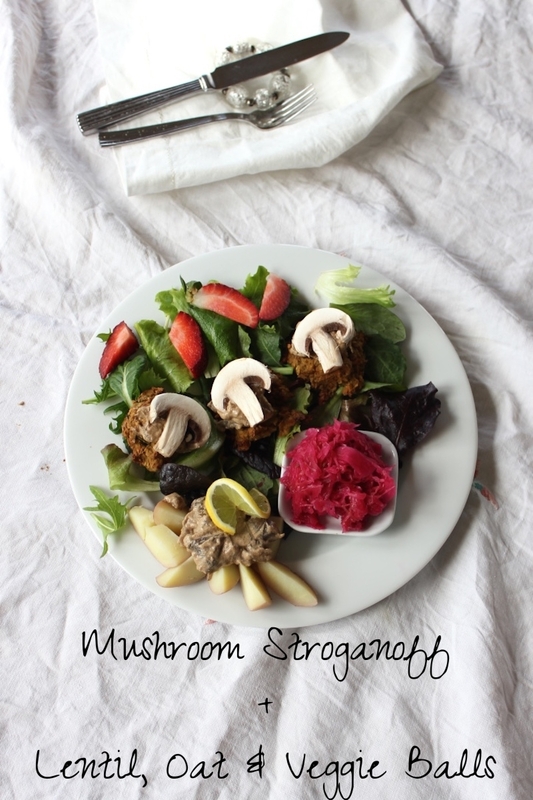 Have you tried making vegan stroganoff before? Let us know in the comments! Heat a splash of olive oil in a heavy bottomed pan. Slice mushrooms thinly. Sauté mushrooms, garlic and onion in pan for about 5 minutes. Add paprika and white wine, then place a tight fitting lid on top of the pan. Turn heat down low and simmer gently while you make the cashew cream. Place cashews and water in a high-speed blender and blitz on top speed for 2 minutes. Pour cashew cream into pan, and gently simmer for about 15 minutes, to allow the flavours to develop. If the mixture is drying out too quickly, add a splash of water. Sprinkle finely chopped thyme on top and stir through before serving on top of pasta, potatoes or rice. To taste: salt & pepper, fresh herbs, harissa paste, soy sauce, nutritional yeast (or use any of your favourite seasonings). 1. Cover lentils with water, bring to boil, then simmer for 20 minutes or until soft. 2. Combine flaxseeds and water in a small bowl and leave aside for 10 minutes to gel. 3. Heat oil in a frypan. Sauté onion and garlic for 2-3 minutes. Add the rest of the vegetables and sauté until soft. Set aside to cool. 4. In a food processor, combine cooked lentils, vegetable mixture and flavourings (sauces/herbs/spices). Add flax eggs and process until smooth. 5. Add oats, a little at a time. You may need more or less, depending on your mixture's wetness. 6. Spoon into ball shapes. You can either bake these in the oven like we did (cook for approx 15 mins) or fry them on the stove top (around 7-8 minutes). 7. Remove from heat, and serve with stroganoff. These would also be great with pasta sauce, roasted veggies or salad. Leftover veggie balls are super handy to have on standby in the fridge or freezer.